This entry was posted on August 27, 2013 by Jessica Anderson. College Football is huge in the US. People are passionate for their teams, whether they went to the school or not. What is the draw? What makes College Football so special? I share my thoughts below. 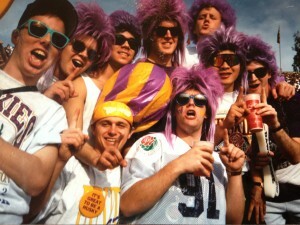 Jeff and friends at a Husky game 20 years ago. I grew up watching lots of football. My dad played in college - he was an offensive lineman - and according to family legend, his claim to fame was pummeling Mean Joe Green. His football career ended early, so instead of playing, he watched football on TV, both college and NFL, and attended most of my high school's home games. I learned football through osmosis. 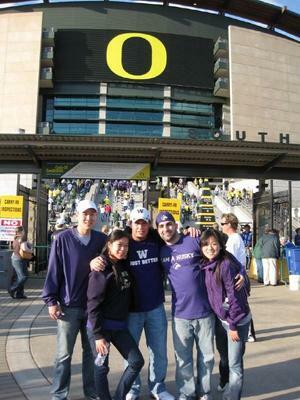 I didn't really have any experience attending college games until I enrolled at University of Washington. I worked for the athletic department, and as a perk, was able to go to the football games for free. This was during UW's golden years, when Don James was coach. The games were a blast and Rose Bowl road trips were even better. Many memories and stories came from those experiences during college, and now the memories continue. Our Production Manager Tom is a huge Husky fan. Here he is at the Oregon Game. Twenty-some years later, college football is less about the game itself and more about traditions, gatherings, and the escape from everyday work life. Every Saturday home game in the fall, tailgating fans look forward to meeting with their buddies and spending the day with friends, family, and new friends of friends that they will meet. Besides the actual game, college football Saturdays are about catching up with people you neglect to see because of your busy work schedule and enjoying food and beverages while connecting with others. Its about playing games with your friends, whether its Beer Pong, Flip Cup, or Bean Bag Toss, and checking out all of the other fans, witnessing and learning their routines and traditions. The day is capped off with a team that you are passionate about. Regardless of the outcome win or lose, you can rest assured that many people will celebrate with you or cry with you afterwords. That is the draw of college football. 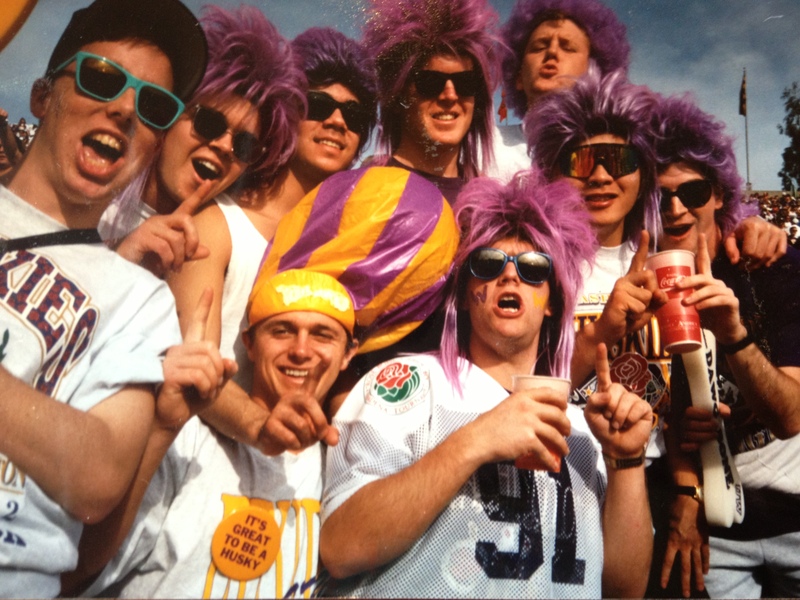 Make some new memories with your tailgating group by getting competitive! I see two areas where adding awards could bring your party to the next level. 1. Games: Create contests around your tailgating games. We have awesome trophies for Bean Bag Toss, Beer Pong, Flip Cup, Horse Shoes. Or make your own custom trophy for whatever game your group plays. You can even do a perpetual trophy that can be passed from game to game, year to year, upping the bragging rights! 2. Cookoffs: Food and beverages is a huge part of tailgating. One idea is to host a cook-off and award your winner. We have chili cook-off, barbecue cook-off, and baking awards that are small, inexpensive, and fun for a winner to get. Consider giving your tailgating bartender a "mixologist" award, or your tailgating host or hostess an award to thank them! Regardless of your traditions, the game guarantees to be exciting, as young men play for their love of football, not for million dollar salaries. But even more important than the game, Saturdays in the fall are about catching up with friends and family you don't get to see other times of the year and making new memories. Enjoy your team and Go Dawgs!